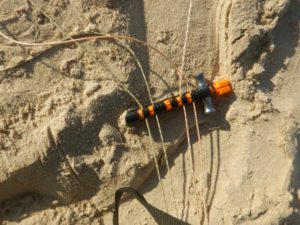 Do we need more toys in kiteboarding? Due to technical inventions, like quick release safety systems, the safety of our sport improved a lot. But still serious accidents happen, sometimes due to a lack of safety tools. So we welcome any new device which makes it a bit safer. 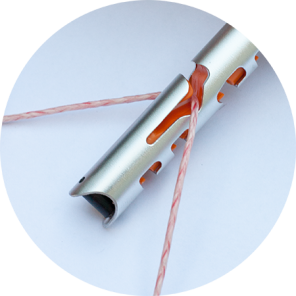 In this case we tested The KiteCleat; a tool with two functions; a knife to cut lines and a line storage function to get your kite ready for action quicker and easier. Let’s focus on the safety first. Statistics tell us that with 10,5 injuries per 1000 sporting hours kiting is relatively safe. It is less than for example soccer or handball but still something to work on. In our opinion nobody should go out kiting with out a knife. The risk of -for example- drowning due to a bundle of kite lines on your legs when doing a self rescue, is very real. A typical example where a simple knife can save your life. The kitecleat does come with a serious price; depending of the version it is 20 to 40 Euro’s. We could use a couple of different Kitecleats for over six months to see how much added value the Cleat has to the sport. After two French Pilots came up with the advanced weather predictor WEZR, a bar including lines under 300,- Euro from the French Kite Attitude, we now got another invention from France: the Kitecleat (in French called a Kite Surf Voilier, the owner Sebastien uses the brand KSV. Other products may follow under this brand). Before we could use the Kitecleat properly we had to get some assistance. 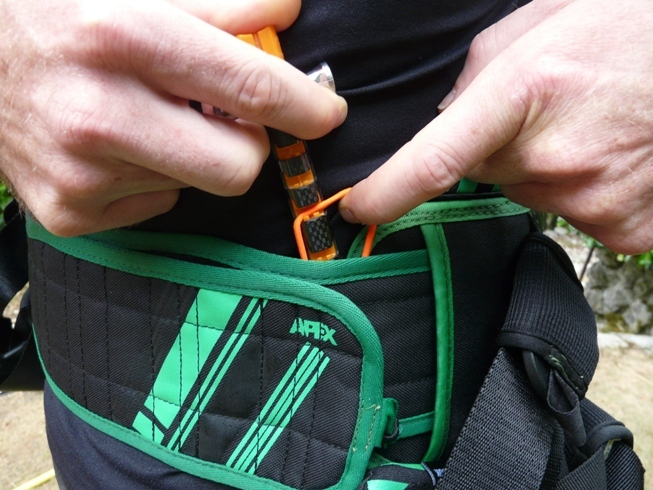 Especially the placement of the Kitecleat on the harness (see the product video) needed some explanations. positioned sideways in the patch which covers the hook. The knife function is -of course- only useful when you have it on you. After 15 years of kiting one of us actually needed his knife to cut his way out of a kite which was slammed over him by a fellow kiter. This certainly changed a potential critical situation to one with just material damage. Imagine your lines are perfectly aligned on your bar. You just need to hook the end of the lines to the kite, r oll them out and you are ready to go. That is exactly what the Kitecleat does. We haven’t seen any tool before like this, which makes you wonder why. A reason could be that -bluntly said- it will just save you a couple of minutes each time you rig up a kite. See it as a bonus on your knife. 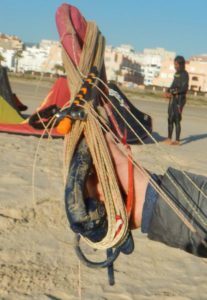 Some tips are involved in getting it right; like don’t get the lines of the kite before you attach the Cleat and make sure you don’t move the Cleat towards the end of the lines (otherwise attaching them next time is impossible). It is bit of a hassle. 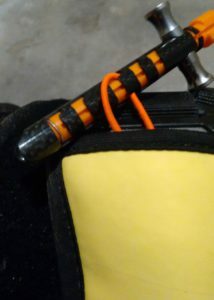 Both getting used to connecting the Cleat to the lines correctly and putting it in your harness in the right position. Our tested prototype’s where also suffering from the sand a bit. The spring needed some good washing to be able to hold the lines firm enough. A stronger spring maybe the solution. There is also a version of the Cleat without a knife, which might be an option if you already got one. and dome versions of the Cleat don’t float, which made us scared of loosing it (just like the traditional knifes) and never getting it back. So take the one that floats. But certainly a knife, if you haven’t got one, is something which we all should be carrying while kiting. But the cleat does come with quite a price. The cheapest (no knife and not floating) costs 20 Euro’s, the one with a knife 30 and the float-able version with knife is 40 Euro’s. I hope website (still under construction) will from now help for the hassle but you are right, you need to prepare it first time. 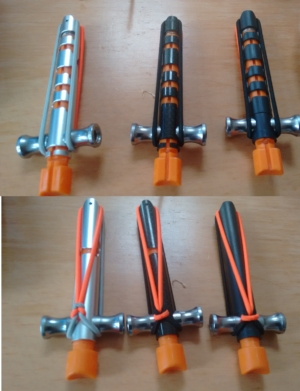 – Spring setting as been changed already, all primary user are invited to return his kitecleat(s) to KSV warehouse to get it modify if needed, Around 1€ sending charge will be refunded in elastics that has had a little weakness also on first released examples. 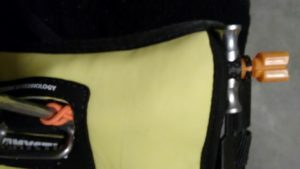 I have to develop also in the usage section of the website the other way to attach it to the harness. There are but it needed to be prepared well to have the kitecleat pulled inside it’s pocket by the elastic. Don’t know if saying that it’s homemade / handmade in France for design, control and assembly is interesting but anyway, it’s the case ! I do something similar for the line management (using a hair clamp). It saves the time you walk the lines and reduces the risk that somebody lands over your lines. Just ordered my pair of kite cleats and its definitely interesting. The quality and durability is guaranteed, hence I am highly recommending them to everyone out there.